Is Your Wi-Fi a Seamless Customer Experience? For marketers and those invested in customer experience, customer data is the foundation and single point of truth that is used to inform strategic decision-making. It allows us to see our customers in full detail and to understand their behaviors and motivations. Contextual, or location-specific data, goes even deeper than simple demographic information by helping us to understand customer interactions. Wi-Fi captive portals have quickly become the dominant method of collecting such data – but what does that mean for the customer? A Wi-Fi captive portal is essentially a web page that appears after a user connects to a public Wi-Fi network, which requires the user to accept terms (and often provide name and details) before he or she is allowed to browse the web. So how do Wi-Fi systems collect customer data? It’s the unique MAC address of smartphones and other devices that enable the Wi-Fi network to detect distinct users. Most devices use “active scanning” which means the device transmits a probe request and listens for a probe response from a Wi-Fi access point. Because the user’s device needs to be within range of a Wi-Fi access point, it’s easy to know how people are moving around a location and for how long, based on the probe responses triggered from the different access points set up around the location. Wi-Fi isn’t just a nice service to offer customers, it’s one of the most important services for customers, with evidence showing that customers are likely to spend more time and money with a business that offers free Wi-Fi. When it comes to assessing the quality of service your business provides, there are two main items to consider: the speed/bandwidth of the Wi-Fi and the captive portal login experience. For hotels, it is increasingly becoming the expectation that the Wi-Fi be fast enough for FaceTime or Skype video calls or for streaming content. A recent study highlighted Wi-Fi speed as the number one concern by hotel guests. Researchers in Norway actually found that fast Wi-Fi was more of a priority than free Wi-Fi for hotel guests. 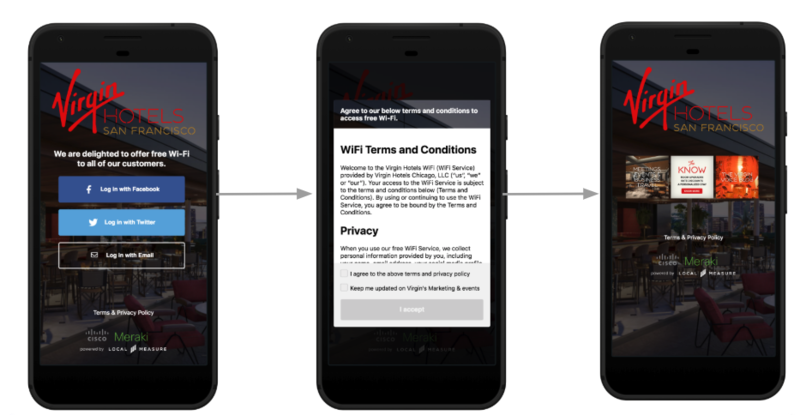 Service design is critical to nailing customer experience and shouldn’t be overlooked when it comes to the Wi-Fi login experience. We’ve all encountered bad captive portals - they’re the ones that make you fill out long forms or use automatically generated passwords which are sent to your email so that you have to jump back and forth (visit enough airports and you will sure enough encounter one). Poor customer experiences cost money and can cost you lost customers. So what does a good login or Wi-Fi onboarding experience look like? First of all, it needs to be fluid as possible. Look for modifications that will shave seconds off the time it takes a customer to join. Travelers, shoppers and restaurant-goers have limited time, and don’t want to spend ten minutes joining the Wi-Fi network. Next, it should be comfortable and familiar to the customer. If you take them to a captive portal that looks foreign or complicated, you will confuse or frustrate them. Local Measure’s Wi-Fi solution allows businesses to customize the captive portal with their branding, includes the option for customers to login quickly through social media, and has a simple acceptance of T&Cs followed by a welcome screen that can display any relevant offers. User interface when logging onto Virgin Hotels San Francisco Wi-Fi, powered by Local Measure's Social Wi-Fi technology. Since last year, GDPR compliance is another important component to consider. If you wish to add users to marketing emails lists for instance, GDPR requires a clear “opt-in” which the customer must explicitly accept within the terms and conditions. Consider the other touchpoints in the customer journey, for example: is there a point in which you ask for in-moment (during-stay) feedback? If so, see if you can integrate the Wi-Fi login details to pre-populate the customer’s details within the feedback request to make this process more fluid. By considering the customer needs (fast Wi-Fi and a seamless login experience), you can offer a positive exchange of data that will benefit your business as well as the customer. Learn more about Local Measure’s Wi-Fi solution and how it can power your CRM database.